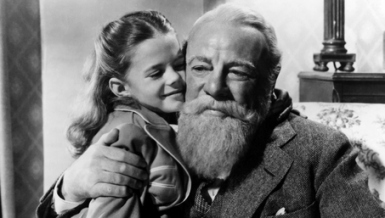 To call Miracle on 34th Street a great Christmas movie would be underrating it; it’s a great movie, period. Some might dismiss the movie as sentimental, but in fact it’s a passionate, carefully constructed defense of sentimentality, set not in a world of unmitigated sweetness and nobility, but in a world of heartbreak, compromise, greed, and bungled good intentions. There’s not one character in Miracle on 34th Street who doesn’t display some blend of admirable and disreputable traits; Doris is kind-hearted but ruthlessly pragmatic, Fred is patient and brave but far from blind to his own career advancement, and even Kris Kringle has his petulant moments — indeed, the movie would have no third act if he didn’t. The movie isn’t about perfect people living beautiful lives in a fluffy, postcard landscape; it’s about flawed people trying desperately to find something they can believe in. Edmund Gwenn’s performance is a landmark in cinema history — perhaps the only fully convincing portrayal of Santa Claus ever committed to film. (The fact that his character isn’t necessarily Santa Claus only adds to the effect.) The note-perfect casting in even the most minor role gives the film a rich and broad canvas; it’s as much about New York as it is about Christmas. And as for the central dramatic question of the movie – Is Kris Kringle Santa Claus? – the movie, brilliantly, never provides an answer. If “faith is believing in things when common sense tells you not to,” why should the filmmakers let us off the hook?